Answering your questions about physical therapy, fitness, sports performance, baseball, business, and career advice. Submit your questions below. 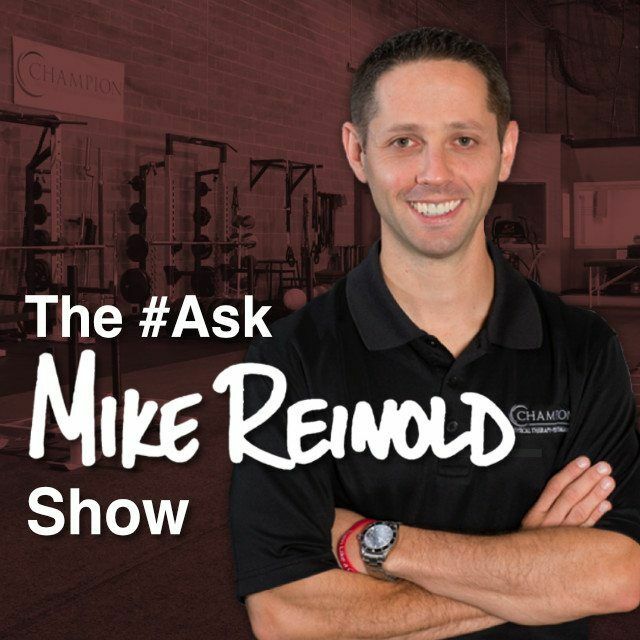 Welcome to the Ask Mike Reinold Show, where we answer your questions about physical therapy, fitness, strength and conditioning, sports performance, baseball, business, and career advice. Join myself, Lenny Macrina, Dave Tilley, Dan Pope, Mike Scaduto and my team at Champion Physical Therapy and Performance in Boston, MA and learn how we help people feel better, move better, and perform better. I want to have a candid experience with us and have you feel part of the team as we sit around and talk. To me, this is where the best learning occurs – when you just sit around and talk. New episodes premiere Wednesday nights at 8:00 PM EST on both Facebook Live and Youtube Live, or listen to the audio podcasts the next day on iTunes, Spotify, Stitcher, and more. Search for the “Ask Mike Reinold Show” in your favorite podcast player. This is not a contact form for Mike. Please only submit questions for the podcast here. Please click here for additional contact information. We really can not offer specific medical advice. Please do not submit questions looking for specific medical advice. Generic questions about how to deal with certain injuries or dysfunctions are fine, but please don’t submit a question looking for specific medical advice.